There is a solid argument that Nurses are some of the hardest-working people on the planet. From 12 hour non-stop shifts to remaining clinically current, there isn’t much that a nurse doesn’t do. Providing care and completing paperwork only scratch the surface. Nurses don’t always know what their patients and their families are thinking and what going through. That is why we never forget that special nurse that showed empathy, compassion, and respect when our pain levels and sorrow spiral. You know that special nurse I am referring to- the one that treats patients and their patient’s families as their own. So, why would a special nurse be required to have a fingerprint background check to perform their job? Simply stated a few bad apples have to ruin it for everyone. 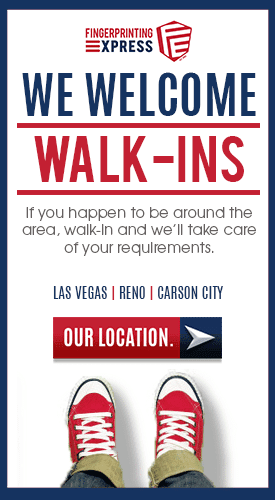 Nevada began requiring fingerprinting nurses for all initial applications on January 1, 2000, and upon renewal on October 1, 2010. The most common question we receive from nurses is regarding why they must be fingerprinted all the time – especially my traveling nurses that have to be licensed and fingerprinted in each state they work. While it is inconvenient at times to go through the licensing process it is in place to protect our most vulnerable populations. Fingerprint me once okay; fingerprint me twice? Sometimes a nurse has to be fingerprinted twice on the same visit at the same time. This is because we must put the lawful reason on each fingerprint submission. One reason is for the nursing license and the other reason would be for the employer. 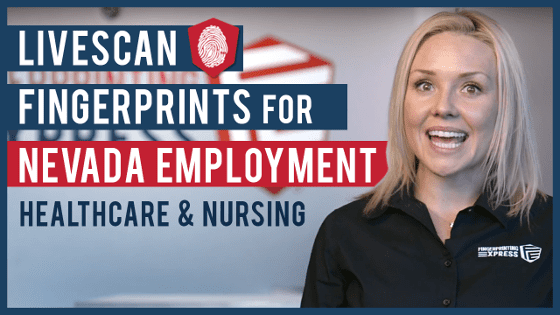 The nurse is fingerprinted and the results dispatched to the licensing board and the other set of fingerprints are sent to the employer, usually long-term and disability care. Currently, there isn’t a civilian database of fingerprints, we have to fingerprint nurses for renewals so that the licensing board knows the nurse didn’t commit any disqualifying crimes since their last licensing process. Most nurses with decades of experience have the toughest to collect fingerprints. This is due to a number of factors. Major factor number one is that nurses wash their hands… a lot. This combined with paperwork, computers, and age takes a toll on their fingerprint ridge detail. It is common for career nurses to have their fingerprints rejected for low quality. Fingerprinting Express guarantees our work and we will fingerprint our nurses again at no fee. While we do the best we can to collect the best possible fingerprints the first time, with some hard working nurses all the tricks up our sleeve won’t show the fingerprint ridge detail. Technology has come a long way in both industries of fingerprinting and nursing. Medication scanning to online office visits with patients with fingerprint and retinol technology that seem evolve almost daily. Maybe someday we will have a fingerprint machine that can go back in time to show fingerprint details before time took its toll. Until then, we will continue to hold hands and assist in the licensing process with some of my personal heroes.